Thermal printers, both thermal transfer and direct thermal printers have been available since the late 1970’s, with Sato being the first company to introduce a bar code label printer. Today, other label printing options include impact, laser, and ink jet. 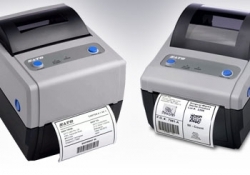 However, for the majority of industrial labels which are monochrome, single color labels, and even some pre-printed multi-color labels, thermal printing technology is still the industry standard. Bar codes which are comprised of lines and spaces are designed to be read quickly and cleanly by the equipment scanning them. Most bar code printers print with tiny dots that are square shaped. These squares have straight edges, which is what bar code scanners like to read. While the majority of thermal printers in operation are standard 203 dots per inch, this rather “low” resolution is just fine for most label printing. While 203 dpi equates to 8 dots per millimeter, 305 dot per inch resolution equates to 12 dots per millimeter. So for label formats requiring tiny fonts, or curved logos, 305 dpi will provide a more suitable quality. Some printer companies also offer 400 dpi, and more recently 609 dpi print resolution. A few years ago, Sato released their M84 pro printer which is the only printer on the market that allows for 3 different printhead resolutions. So if a company buys some 203 dpi M84 Pro printers, they have the ability to swap out 203, 305, and 609 dpi printheads in order to meet new or revised requirements. Why does thermal printing, both direct thermal and thermal transfer printing, continue to dominate other label printing technologies? When we consider the other label printer options such as laser, ink-jet, and impact, they are not able to match those benefits listed above. For example, laser based roll printers are priced in the $10,000 and $20,000 price range, and they can’t print on polypro films due to the heat from the fusers. Standard laser printers are inexpensive, but as a rule, sheet fed printers do not have label dispensing and application options; peeling by hand requires a lot of labor. The roll ink-jet printers are priced from $1,500 to the $9,500 range. The thermal papers and media are still the most cost effective, even when transfer ribbons are included. 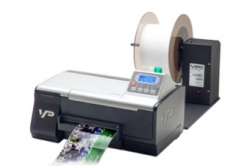 The thermal transfer printers can run papers, films, and foils when paired with the proper transfer ribbon; no laser or ink jet pre-treatment primer is necessary. Thermal transfer imprinted with resin ribbons is extremely durable. These printer models accept roll form or fanfolded stacks of label media. Also important here is the fact that a variety of different adhesives, particularly aggressive ones, can be run through a thermal printer. Ink-jet and laser media typically needs to be top-coated with a chemical to be more receptive for the ink/toner, and printing bar codes with ink jet uses a ton of ink—the ultra-high resolution often is not necessary for industrial labels. Yes, laser and ink-jet offer ultra-high resolution printing. But again, for most label print jobs, this is unnecessary. Laser and ink jet also utilize round dots, which is not the best for bar code readers. The majority of industrial model printers will hold up for a decade or more. I have several models in the field, both industrial and desktop, that have been running great for over 10 years. Finally, most laser and ink-jet printers are USB and ethernet—most do not offer the variety of different connectivity options as thermal models. Of course when we start to discuss color label printing, this starts to get into a different realm. 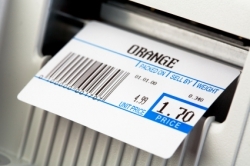 Even so, with thermal printing, labels can be pre-printed with color then imprinted with the variable information later. But for most high volume label jobs, printed in-house, the low cost, fast, old fashioned thermal printers are still the way to go. 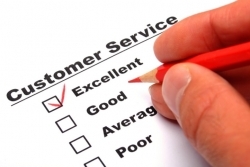 Contact RighterTrack today for help in buying the right printer model for your business.